JÓZEF NOWAKOWSKI (1800-1865): Piano Quintet in E Flat, Op. 17, JÓZEF KROGULSKI (1815-1842): Octet for Piano, Flute, Clarinet, String Quartet and Double Bass in D Minor, Op. 6. 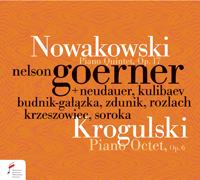 Description: Nowakowski’s 1833 work uses the line-up of Schubert’s Trout quintet and some of that composer’s youthful high spirits are in evidence in this big, four-movement, 37-minute pice from 1833 but there’s Schumann and Chopin as well. Also in four movements but shroter, at 24 minutes is the 1834 octet whose instrumentation may have been suggested by Hummel’s Septet which colors the scherzo while other expected influences are present as well. Nelson Goerner (piano) and assisting artists.